I don’t always embrace the onset of Fall with open arms. In fact… I generally put off decorating for Fall until the last possible minute; desperately clinging onto every last moment of summer. Maybe it’s because I know that the fall-winter-early spring often feels long and grey and long and grey and long and grey where we live. We don’t really get three seasons so much as two: summer and Fog, with a few temperature changes thrown in. But this year I felt ready for Fall. Maybe because we had an extra long summer vacation from school? Maybe because I was excited to get back into the Fall routine? Maybe because we had some of those sunny, crisp, clear fall days that I love so much. Whatever it was, I fully embraced decorating for Fall this year. And I’ve made some changes in our main living areas that I think make our space feel even lighter and brighter then before. 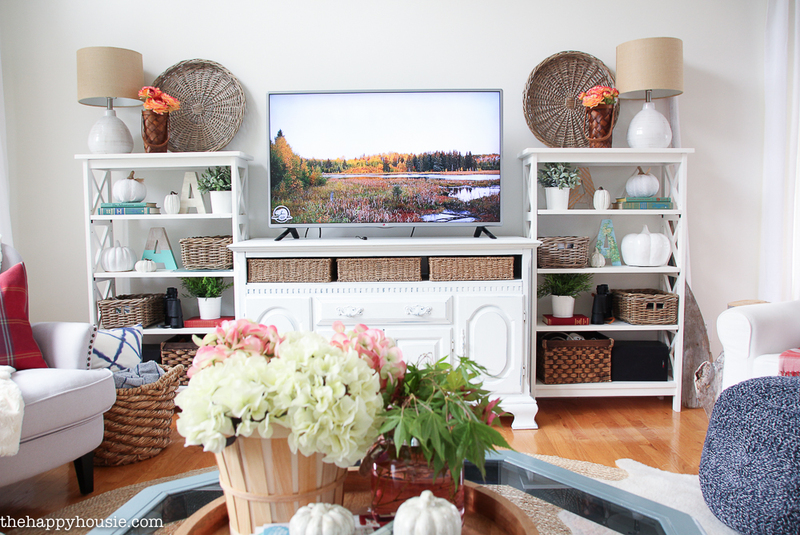 I hope you enjoy today’s Fall living room and entry hall tour as much as I enjoyed decorating for it this year! 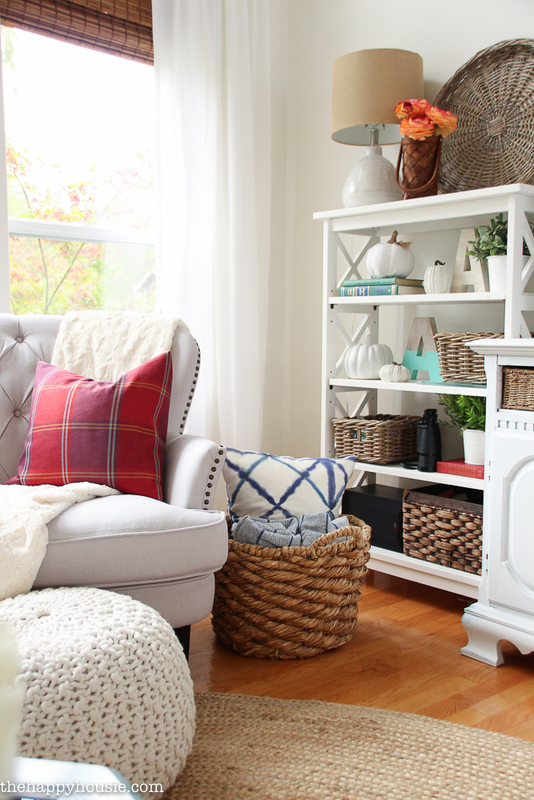 If you are new to my blog and hopping over from one of the other lovely blogs on this Fall Home Tour series, then welcome! My name is Krista and I called my blog The Happy Housie because I think of myself as a “housie” – sort of like a foodie, but for houses. 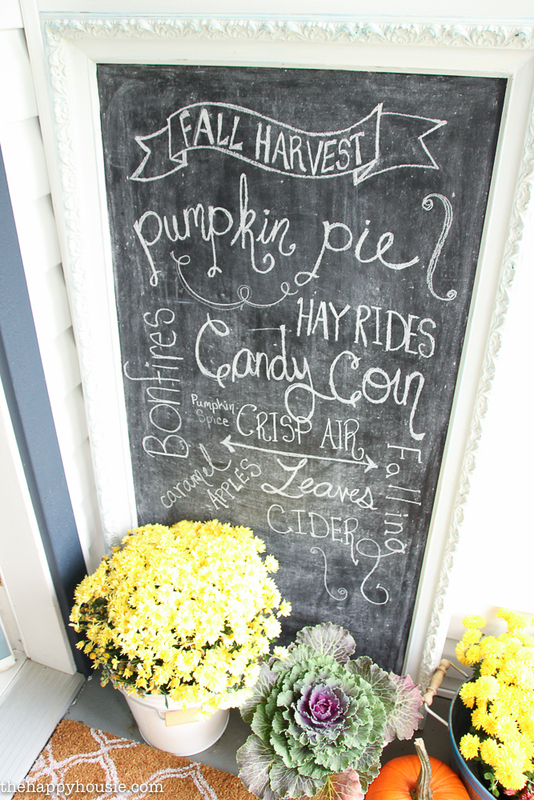 I love all kinds of house-related decorating projects, DIY, crafts, and organizing and share this and more on my blog. You can read more about me here. 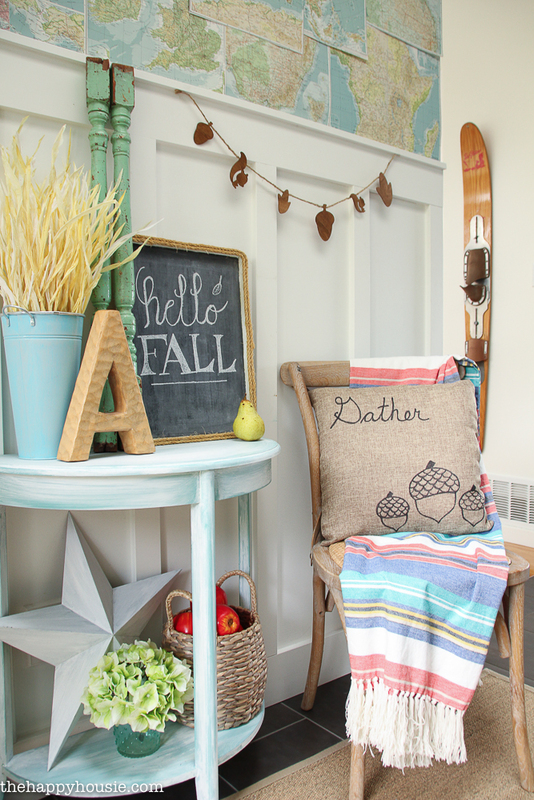 The other day I shared our Fall Front Porch if you want some more details about this space. Since then I’ve added a new wreath and I will share the details about how I made it really soon. When I originally put up the faux map wallpaper, I wasn’t sure if I wanted to commit to it, so I just taped it in place. But months later I still love it and I think I’m ready to commit! The warm browns and yellows in the maps tie in perfectly with the warm and rustic fall accents I’ve added to this area. Details on the cute little wooden garland are coming soon; and the “Gather” pillow is a super easy DIY you can whip up in no time at all! From the entry hall we can move into the living room. 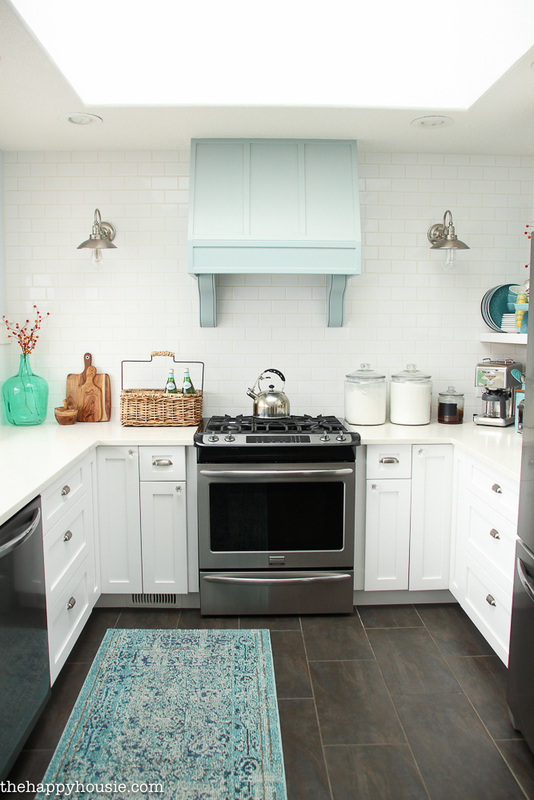 Notice anything different about this space? I switched out the curtains in our living and dining room for the fall and winter; I decided to go with plain white panels so that the pillows, throws, and art would really pop against the white. 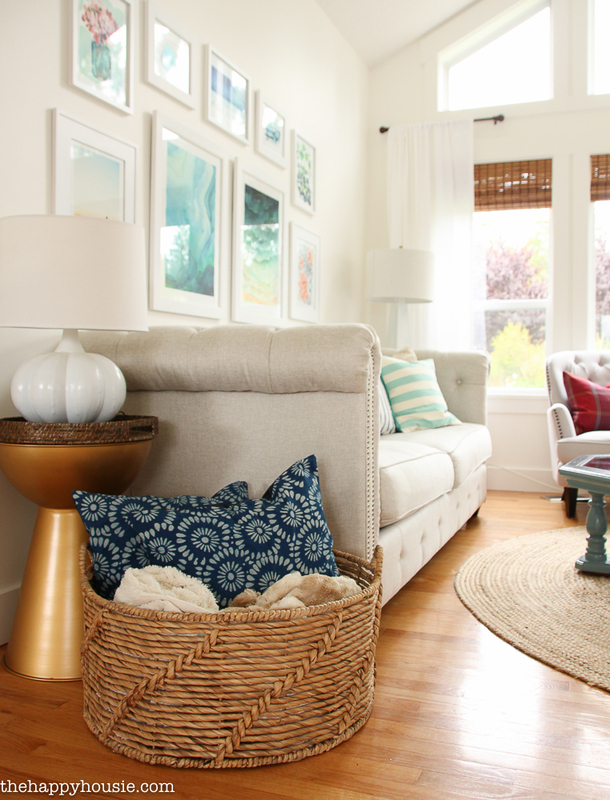 I love how bright and airy it feels; but still really warm and cozy with the warm colours and natural textures in the rug, baskets, and blinds. 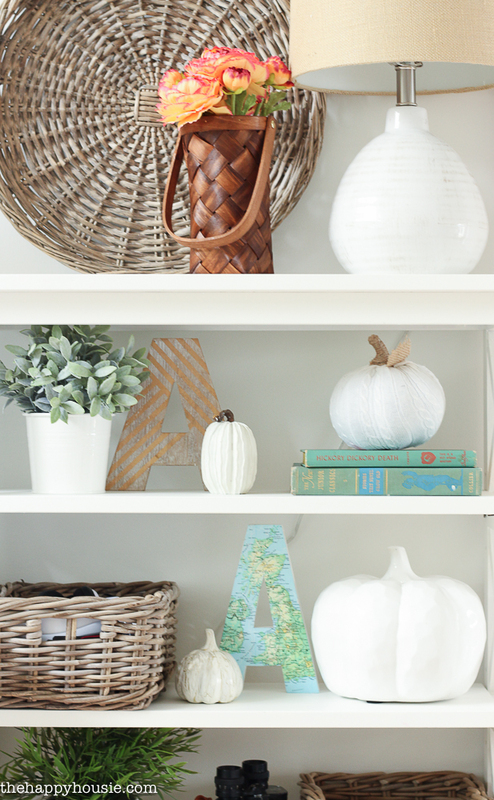 The bookcases are decorated for fall with a variety of white pumpkins and some seasonal flowers – the baskets, lamp shades, and round trays add warmth and texture. Some of the pumpkins were purchased, but some were DIYs as well – the sweater pumpkins and the gold crackle pumpkins were made during a previous fall crafting binge. I made these plaid pillows last fall! I’m so happy I got to use them again – and I love how the colour pops against our tufted upholstered chairs. I’m so glad that we added these bamboo blinds to our living room – they add so much warmth to the space, and now that it is getting dark out earlier, I love to pull them down in the evening. They make our living room feel so cozy! 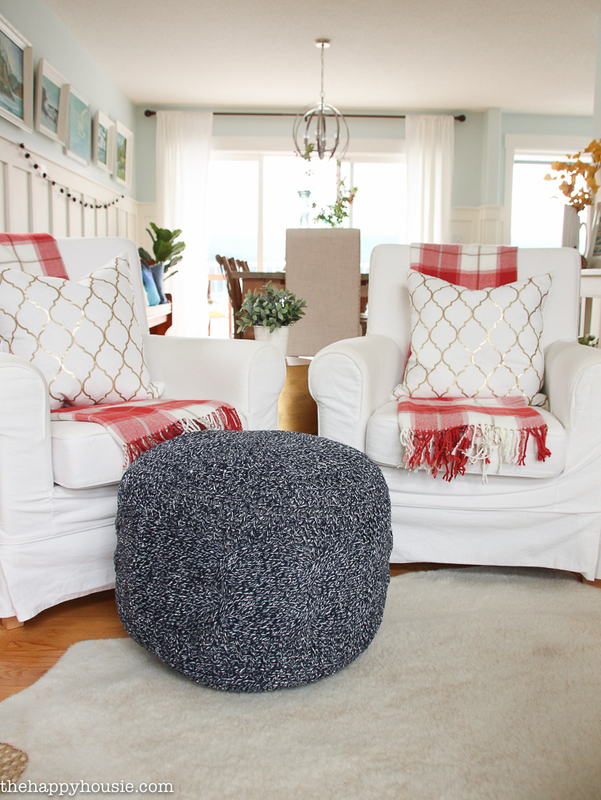 The knitted pouf is another great way to add warmth and texture. 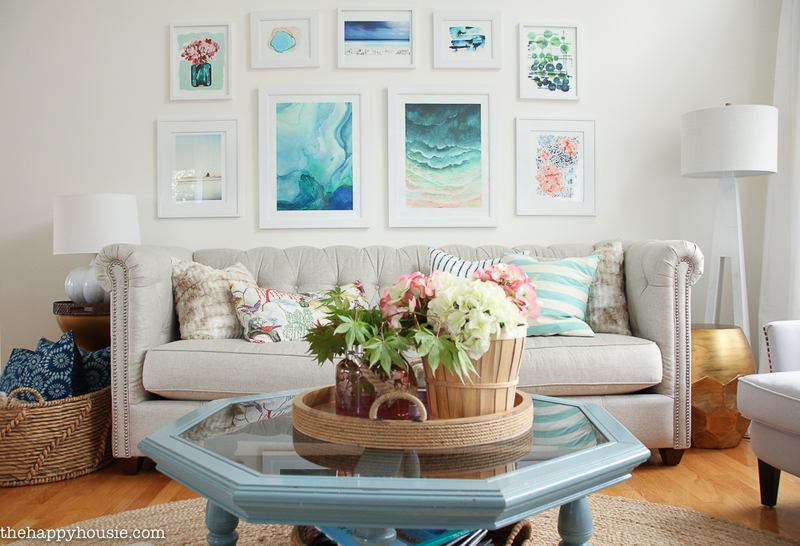 I think our gallery wall above the couch can work through so many seasons… especially with the accents of coral throughout the living room this fall. The pieces are from Minted and you can see the links to many of them below. I found this giant basket at Michaels the other day and my husband rolled his eyes at me when he saw me march in with it. But seriously?!?! How great is it??! Yes, perhaps I could sleep a small child in it, but it’s still a fabulous accent and storage piece for all our cozy winter blankets (and more pillows: insert additional eye rolls). The best thing about these hydrangeas? Or at least until I decorate for Christmas in six weeks. Wink wink. Find similar ones here and here. I have a whole bunch more to show you! And I’ll be back next week with all of that! 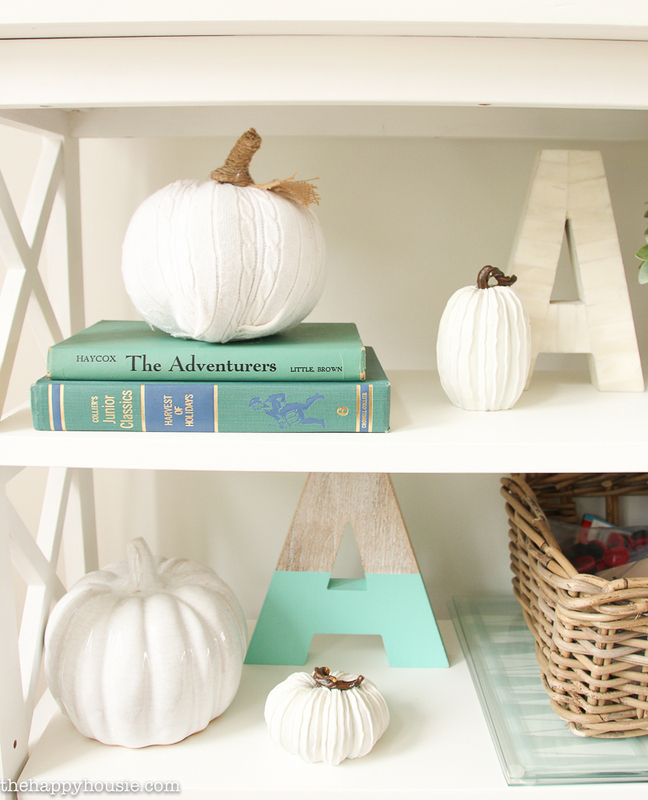 Ready for a little more Fall decor inspiration?!? 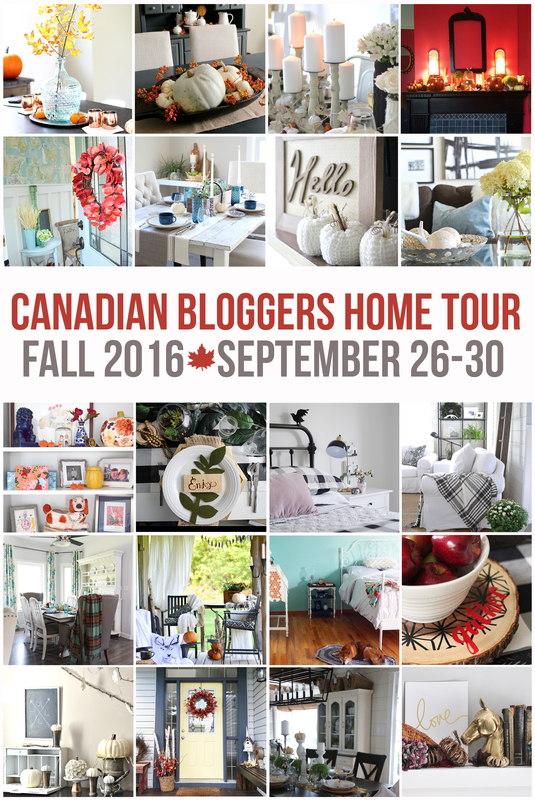 I’m taking part in the Canadian Bloggers Home Tour this week! 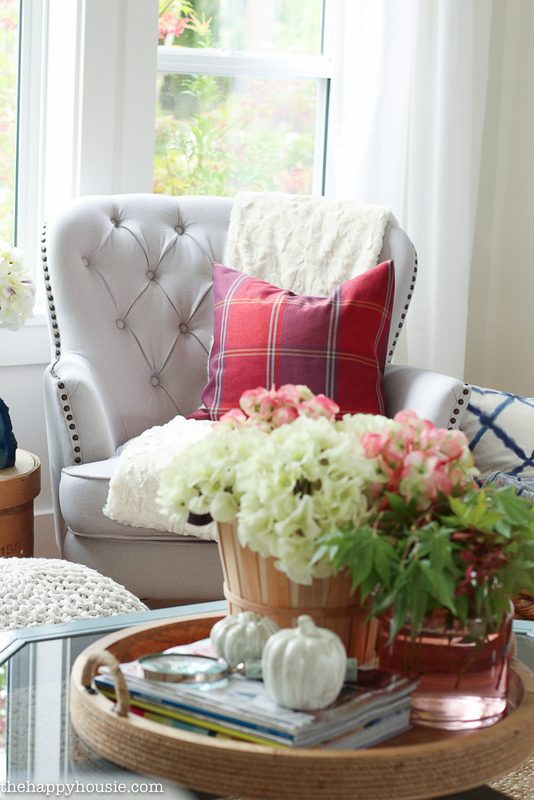 Each day, a new group of Canadian bloggers will be sharing their Fall decor. You can visit each home tour by following the links on the days below. Krista, I looove your fall tour! Things have been so busy and I’m just getting a chance to check it out now. You have SUCH a beautiful and inviting home. Incredible job, friend!!! Your home is really something to die for! Love the way you mix all the color perfectly. I always prefer simple things and basic color like black and navy, but your house is an exception. Thank you Jennifer!! I love black and navy with white as well- but can’t seem to help adding colour! Fall is my favorite and I love the gorgeous natural colors of fall. 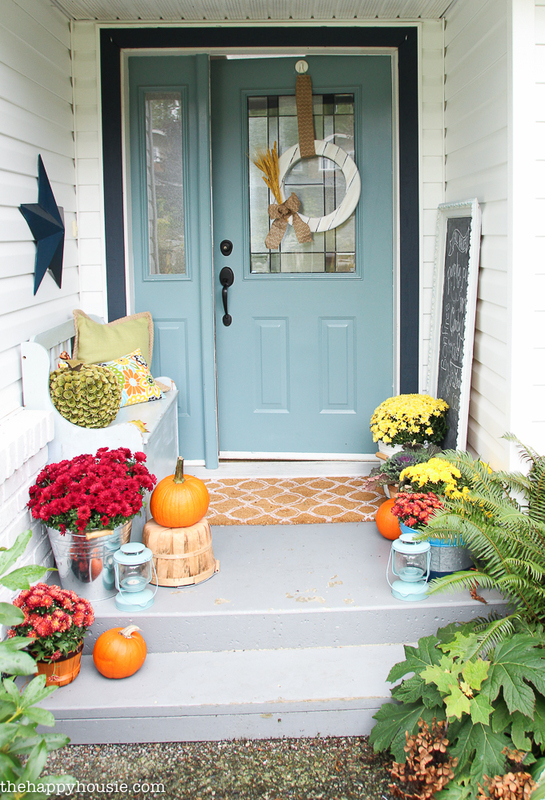 Nothing says fall more than pumpkins and mums and a beautifully decorated entry. Your home is really beautiful. I love the pops of orange which make me think of fall. So glad you share with us at Merry Monday. Thank you so much!! And thanks for hosting and for popping over! 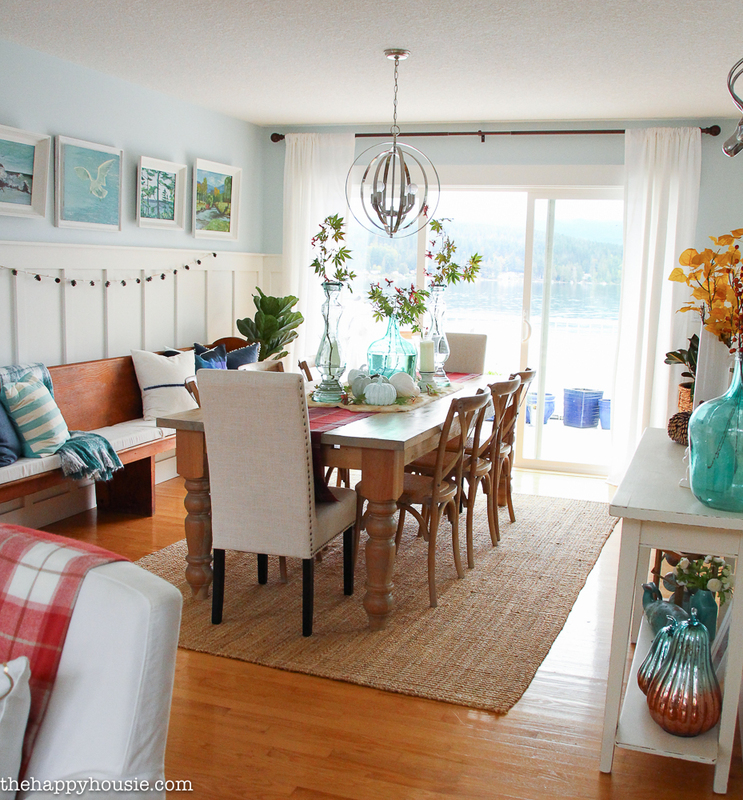 Your space is always so cheerful, Krista! 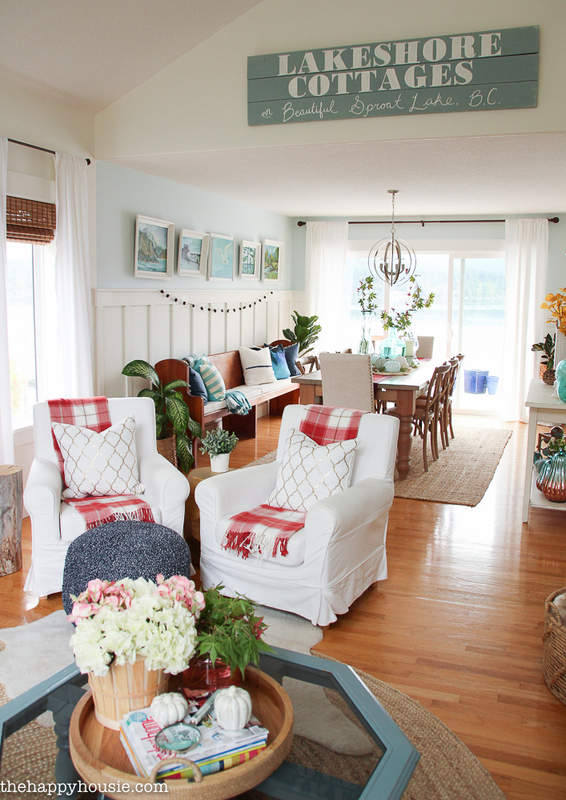 I love how cozy, yet clean and bright, the vibe is! Thrilled to be “on tour” with you! Thanks Tara- and you, as well! 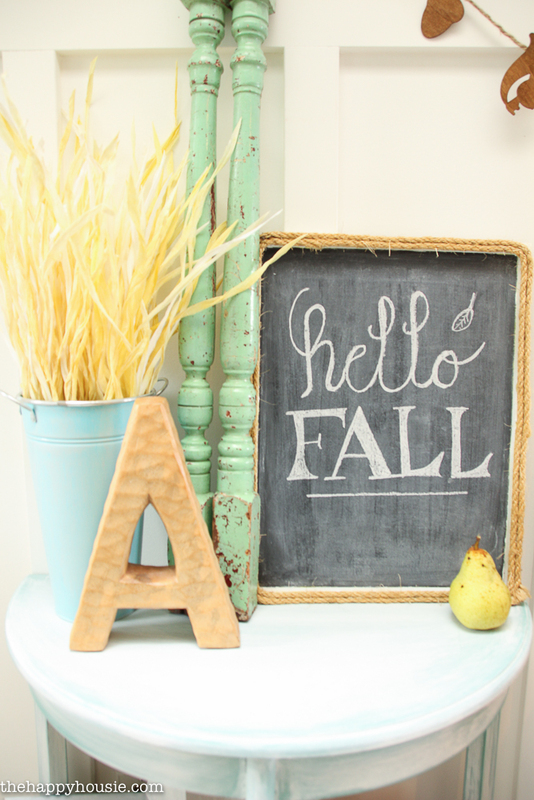 Krista, I love your fall home tour! It’s so colourful, and cozy, and happy. Makes me want a map or two. 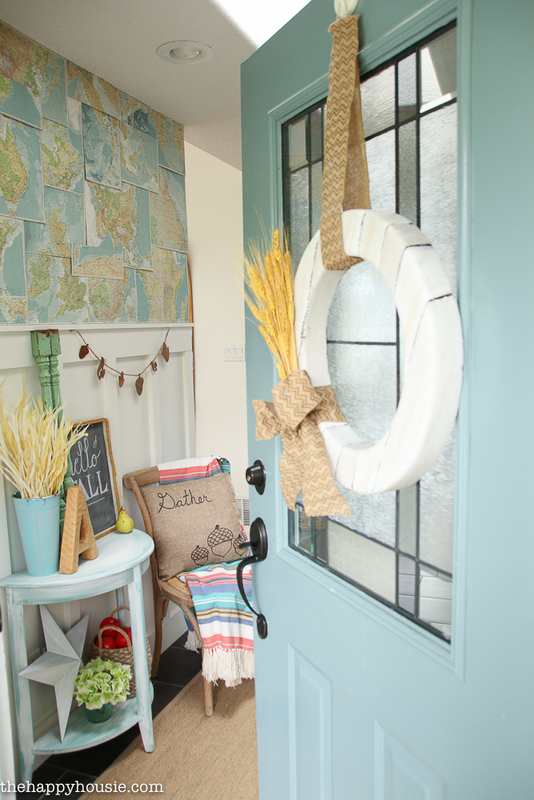 As a Canadian blogger, I always look forward to these seasonal home tours, Krista. 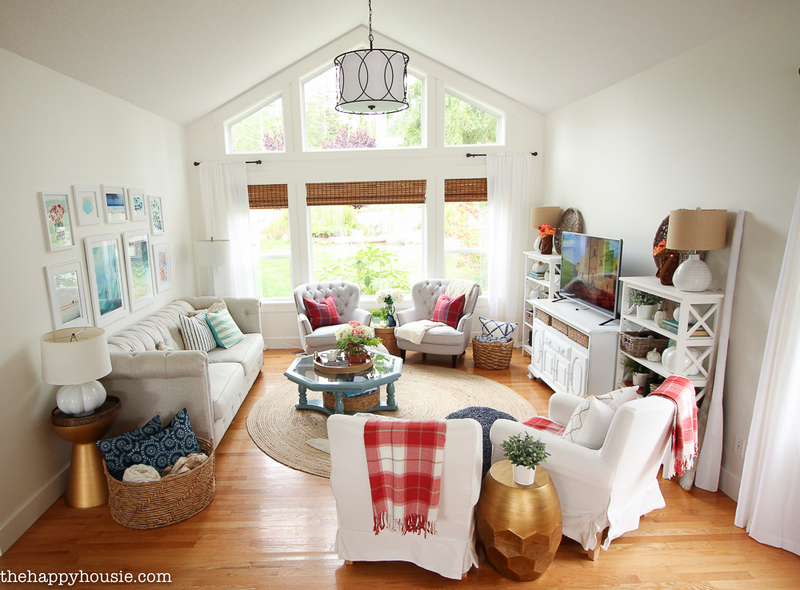 Your home is always so cheerful looking and the new living room design looks great too. The porch and entry are especially inspiring. Thanks for sharing your tour. Thank you Elizabeth!! 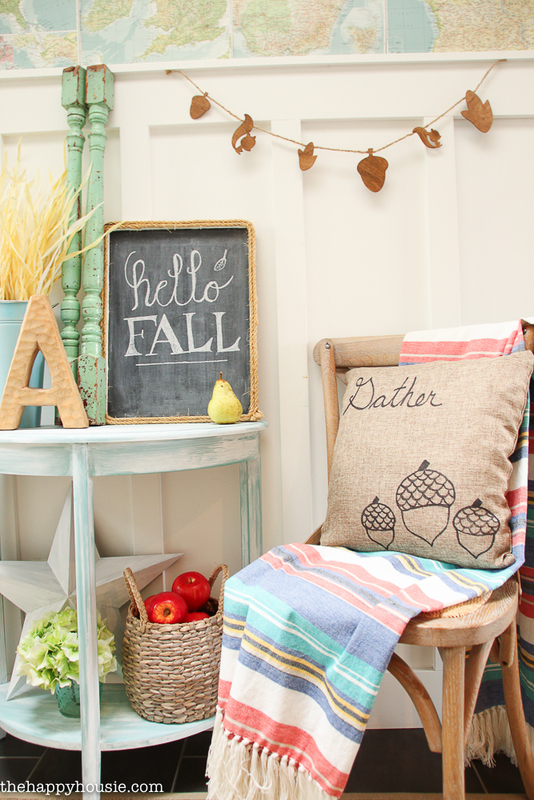 It’s extra fun to play with fall vignettes on the porch and entry because they aren’t spaces you spend a lot of time in! Soo lovely Krista! 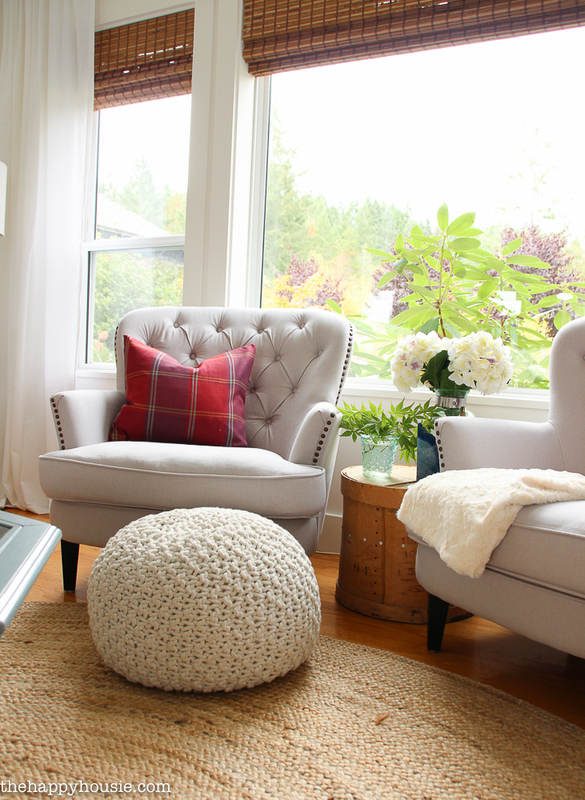 Loving the colours and layering in your beautiful home! Thank you Kim – I always LOVE your light and white home, but I just can’t seem to stay away from colour:) I’m like a homing pigeon for it every time I go into HomeSense! This is so bright and lovely! I love your use of Fall colours but in such a fresh way! Fantastic tour! Thanks Jen! I love the dark coral for fall – it feels fresher then oranges and browns but still warm. There are SO MANY things I love about your space! It’s absolutely lovely. Thanks for sharing it all here for the hop! Loved your tour Krista! 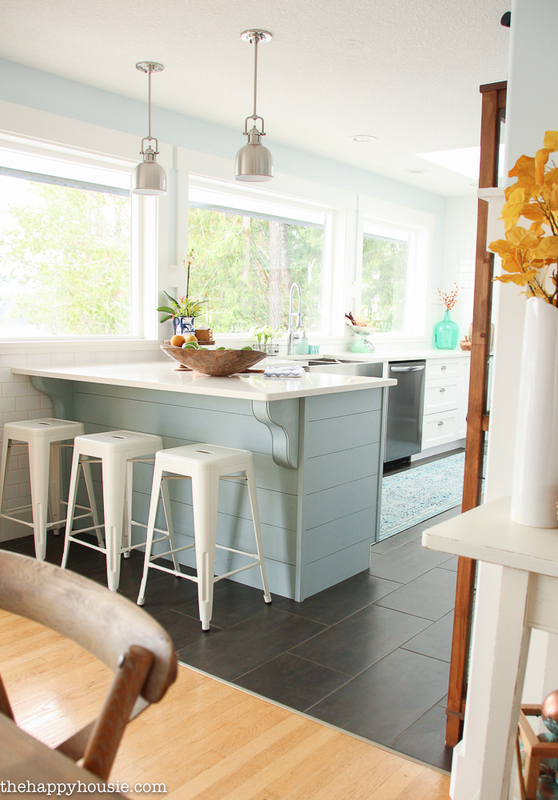 The red accents look fabulous against all the aqua hues. What a beautiful and cozy home! 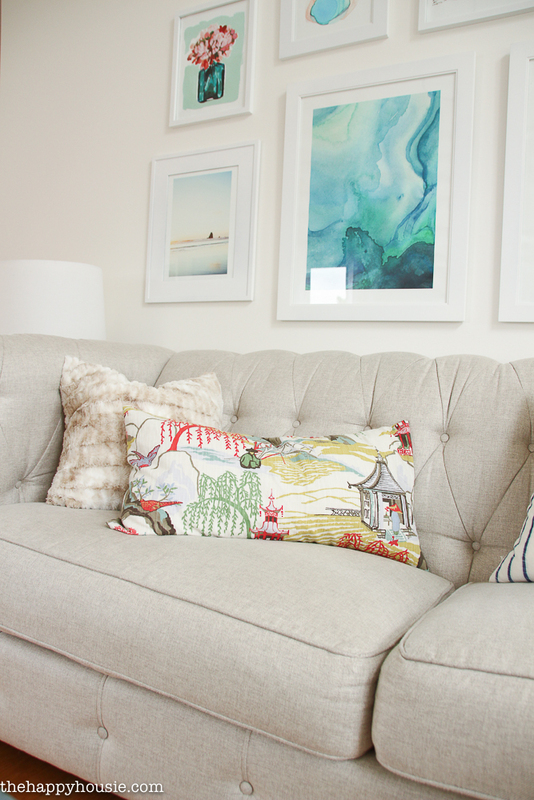 I love all the colors and textures you used in your space! What an open and beautiful space, I can’t believe this is my first “visit” to your gorgeous home! 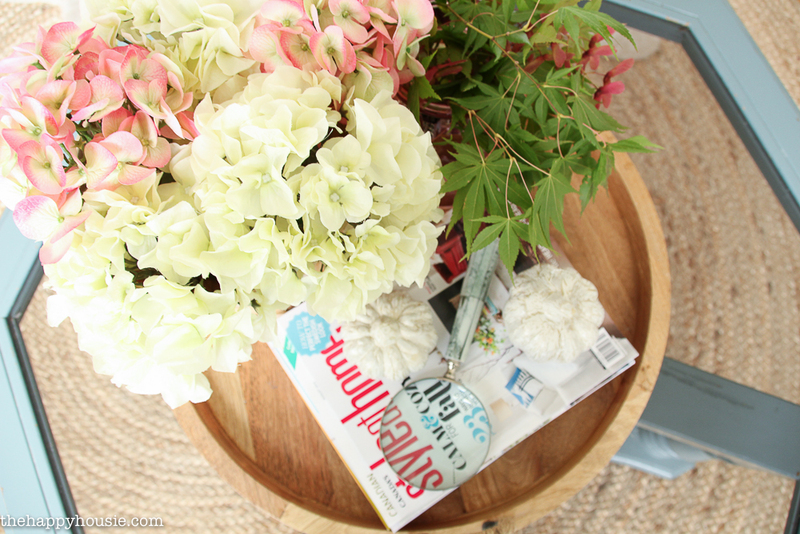 I love all of your coastal touches and those hydrangeas, I can’t believe they aren’t real! Thanks Laurie! I really do love me a good-quality faux flower. In the long run it saves so much money and I love having “flowers” around all the time! Thank you so much Heather! I found that ski at a garage sale right after we moved into this house. The perfect score! It all looks gorgeous Krista! 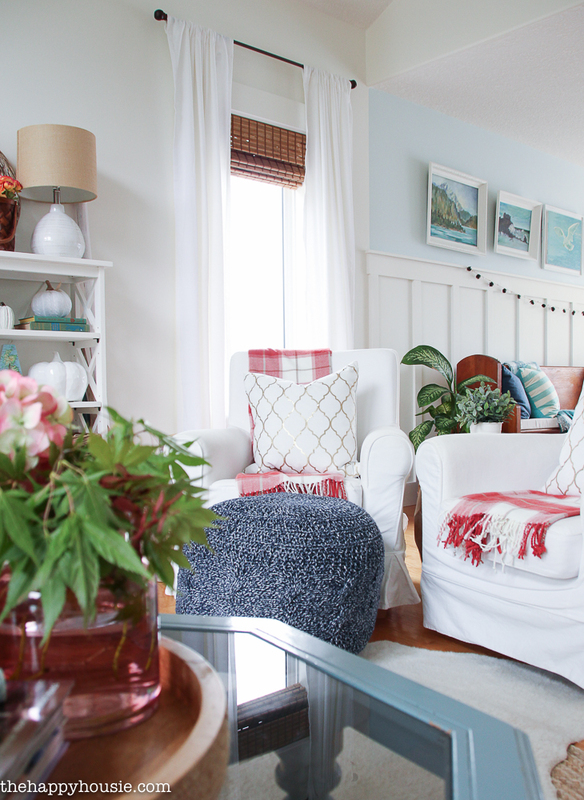 I love all of your pops of color – especially those red and white throws! I’m sure the lake is beautiful at this time of year. Thanks Jenn! It’s always nice and calming to look out at it- we mostly are surrounded by evergreens so we don’t get many fall colours on the lakeside. Lots of calm blues and greys and greens… But the hits of coral match up perfectly with all the Japanese maples in our front yard! I LOVE your coastal vibe! I didn’t know how to mix fall colours into that, but you did it flawlessly! SO beautiful Krista! Thanks Lindi – it’s always about the colour inspiration around here! I’m guessing your home feels bright and cheery on even the dreariest of days. 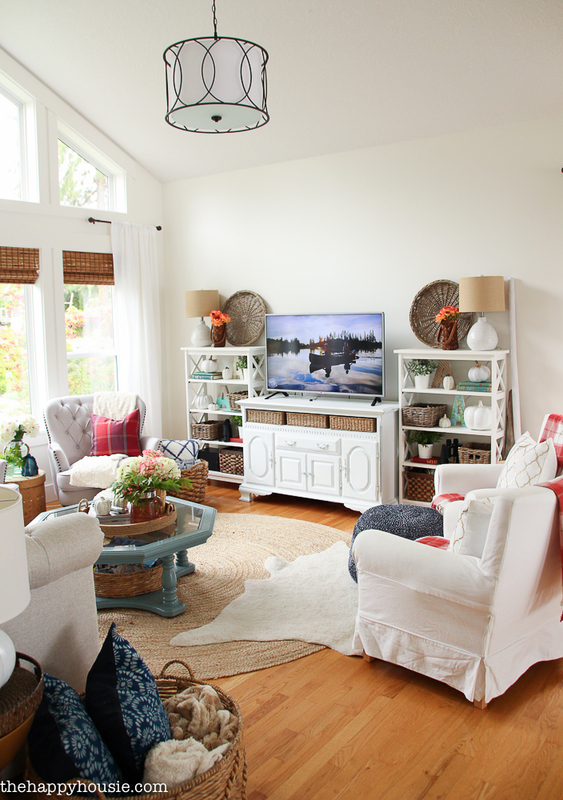 Love your living room. It looks like such a happy place to be! Thanks Shauna! We need it to feel bright and cheery with all the grey days we have on the west coast! Eek! So foggy and wet and dreary all winter. I love it to feel fresh yet cozy inside! 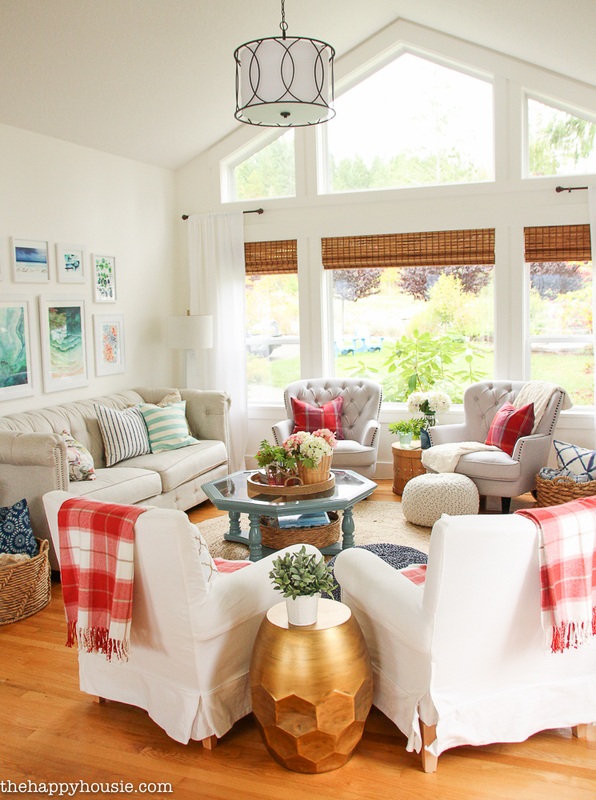 Krista, this is such a beautiful and cozy space! I love all the bright, happy colours. What a perfect Fall retreat! Perfectly fall at the lake house! 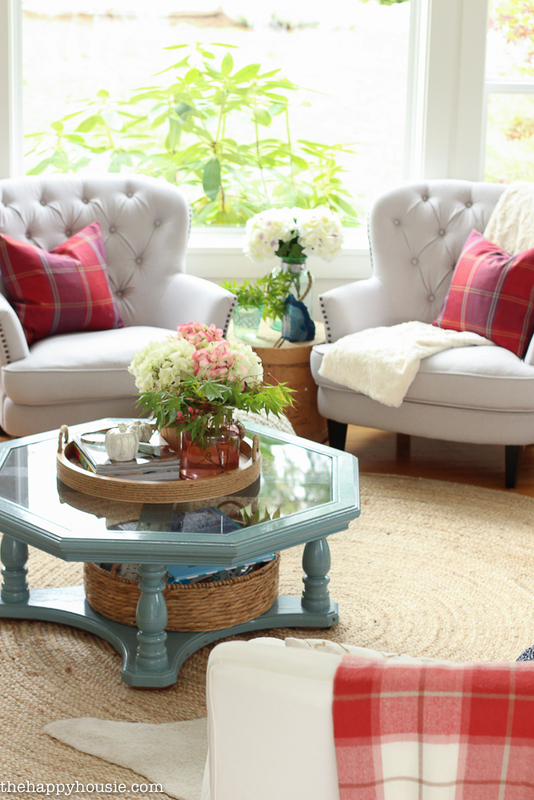 Your house looks like the perfect fall weekend retreat! Thank you Ariel! It would be a great retreat for someone, but we are lucky enough to live here all the time. We are only about a ten minute drive from town! 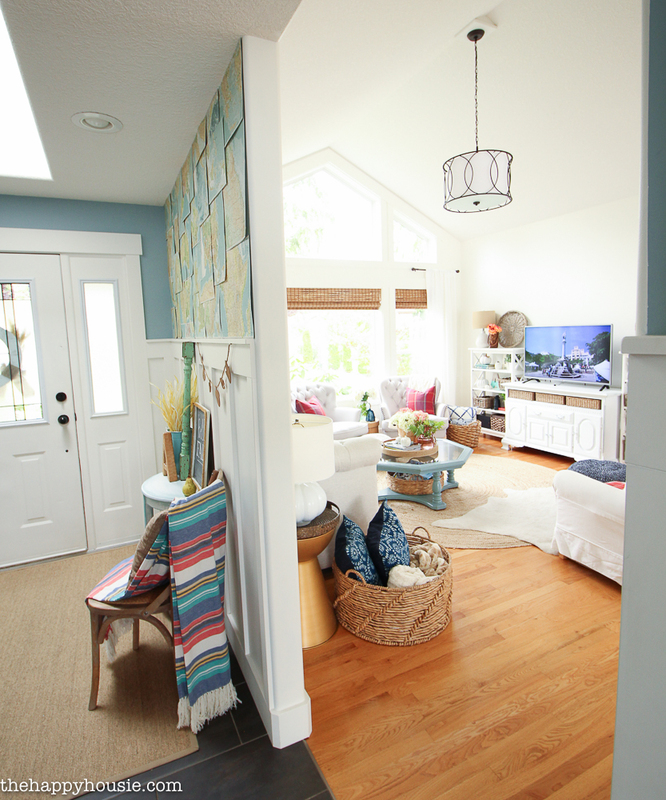 krista, your home just looks like the most cheerful place! 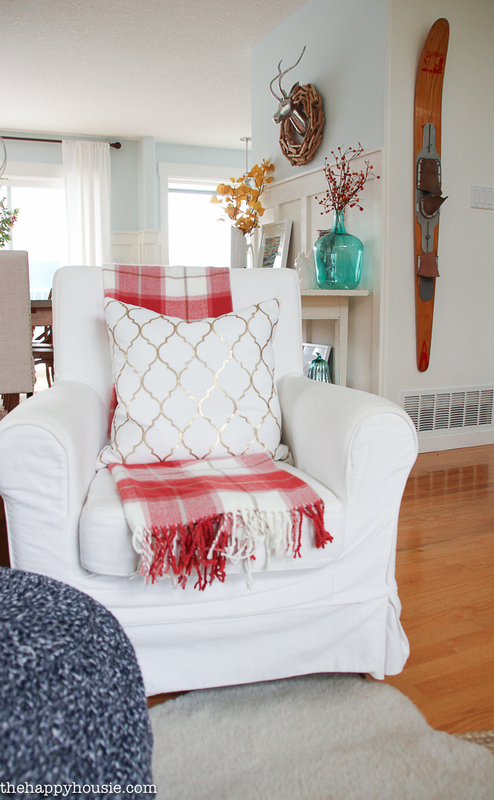 i love the red plaid throws on the chairs and the warm colors you brought in!